In addition to his university teaching, Dr. Rik Noyce is a Royal Conservatory Music Development Program instructor. Studio students are strongly encouraged to participate in this world-acclaimed and multi-faceted music training program; which includes professionally adjudicated assessments. In addition to offering the finest musical training, the Music Development Program supports greater discipline, emphasizes goal setting, and builds confidence and self-awareness far beyond the traditional lesson format. These skills not only build a better musician, but translate dynamically to an exceptionally well-rounded and developed person. Students earn certificates after passing adjudication for each level, some of which may substitute for high school or college credit. Dr. Noyce has had successful students who have moved onward as university music majors in many notable departments; such as the Hartt School of Music, UCLA, CSU Northridge, CSU Fullerton, CSU Long Beach, Loyola Marymount, University of Nevada Las Vegas School of Music, University of Southern Mississippi, and the University of Puget Sound. The Music Development Program provides a recognized national standard of musical success through an effectively sequenced course of study from beginner to advanced levels. It inspires excellence through individual student assessments and allows students to celebrate accomplishment and track their progress with others across the country. It also supports teachers with high-quality and innovative resources. All students deserve the opportunity to celebrate their musical achievements nationally. Join the growing community of teachers, students, and families who are discovering the benefits of the Music Development Program as it enriches their lives. 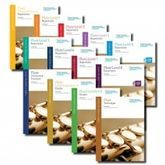 All materials for the Royal Conservatory Music Development Program may be purchased at the online bookstore. Amazon.com also carries some of these materials. Additional recommended material varies from student to student, and will be discussed in lessons. Though Dr. Noyce runs an advanced studio, all experience levels are welcome; the Music Development Program encourages the advanced experiences and results. In the Los Angeles area, Dr. Noyce maintains a private studio in historic Culver City, but he is also available for lessons via FaceTime and/or Google Hangouts. Please feel free to contact him with any questions you may have.